Acupuncture is a Traditional Chinese Medicine (TCM) technique used to achieve a balance of energy, improve function and reduce pain using needles. Acupuncture has been in the making for thousands of years. Acupuncture involves the insertion of very fine needles into specific acupuncture points on the skin to promote natural healing, reduce or eliminate pain and improve the body’s overall function. Acupuncture can be used for a number of conditions including musculoskeletal and nerve pain, gynecological issues, digestive problems, inflammatory conditions, improved immune function and stress relief to name a few. The purpose of acupuncture treatment is to regulate the body’s energy system known as Qi (pronounced Chee) in order to treat and or reduce symptoms of pain, disease and or illness. This Qi flows within the body through all organs and vessels in pathways called meridians, termed the meridian system. It is stated that where there is pain or illness the flow of Qi is blocked and stagnated, and, where there is no pain or illness, Qi flows freely. Sometimes Qi can get blocked, resulting in dysfunction, pain or illness. Inserting needles into acupuncture points along these meridians unblocks the Qi and promotes health. The Ancient Chinese explanation is that channels of energy run in certain patterns throughout the body and over its surface. These energy channels, or meridians, are like rivers flowing through the body to irrigate and feed the tissues. A block in one of these channels is like a dam that backs up in others, thereby causing dysfunction in tissues and organs. These meridians can be influenced and “unblocked” by needling the acupuncture points and reestablishing the regular flow through the meridians. Acupuncture treatments can help the body’s internal organs to correct imbalances in their digestion, absorption and ATP (energy) production activities. For most people, the procedure is painless. Sometimes people feel a little prick similar to a mosquito bite when the needle is first inserted. Occasionally, depending on the condition, there is a dull ache or a warming type sensation around the point. 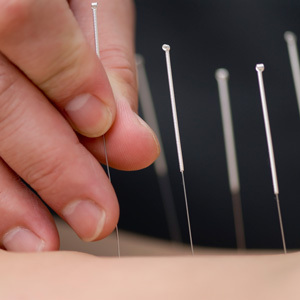 Very few side effects have been reported with acupuncture treatments using disposable needles. If needles are inserted properly, there is no risk to underlying nerves or organs. As with any type of treatment, you should always inform your practitioner of all medications you are taking as well as any underlying health conditions you may have or have previously experienced. You should also inform your practitioner if you are or could possibly be pregnant. Proper information will help Dr. Karelis and the Integrated Health & Wellness Centre team in the selection of the type of treatment that is right for you. Acupuncture can be used as a preventative method to regulate your Qi before the pain arrives. Want to find out if acupuncture is right for you? Contact us today to schedule a consultation.